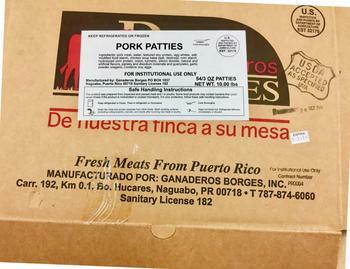 Ganaderos Borges of Naguabo, P.R., is recalling approximately 14,760 pounds of pork patties. The products may be contaminated with extraneous materials – specifically metal. The firm has received a consumer complaint from a school that received the product. The recalled product, bearing establishment number “EST. M32170” inside the USDA mark of inspection, was shipped to institutional locations in Puerto Rico. Consumers with questions may contact Sarai Orozco at (787) 354-9777.